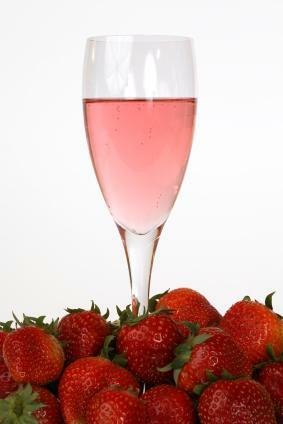 If you are looking for a light, delicate wine with strawberry flavors, look no farther than Fragolino sparkling wine. This easy to drink wine pairs well with desserts as well as light food choices, making it ideal for many occasions. Nando Fragolino: A light and delicious sparkling wine, it hails from the Piedmont region of Italy, and has a fruity and refreshing taste and aroma of berry. Santero Fragolino: This is an Italian sparkling sweet wine with a ruby color and made with natural wild strawberry juice. Toso Fragolino Rosso Red Sparkling Wine: From the Piedmont region of Italy, this wine drink has strawberry and fruity flavors making it perfect to serve with desserts. Just as with any type of Champagne or sparkling wine, Fragolino is best served chilled, somewhere between 43 and 47 degrees Fahrenheit. If it is served too cold, you won't get the wonderful nuanced flavors of the wine; served too warm and it will taste flat. Since most people don't keep a thermometer on hand when serving wine, let your bottle of Fragolino sit at room temperature for fifteen minutes before serving the first glass. This should warm it up sufficiently, but not let it get too warm. If the bottle isn't emptied after the first round, stick it in a bucket of ice water or back in the refrigerator. Remember, it's okay if it is a little bit too cold to begin with because it will warm as it sits in the glass. This sweet wine is perfect to have with dessert or after dinner. It also makes for a great aperitif and goes well with various cheeses. If you love Champagne and sparkling wine, there is no reason you can't drink Fragolino during a light meal. This wine is far too light and bubbly to be enjoyed with heavier meals, so stick with heartier wines for heartier meals. Fragolino is a fantastic alternative to Pinot Grigio, as it is equally light and even more refreshing. Serve Fragolino in the proper glasses. This sparkling wine is best enjoyed in a glass such as a Champagne flute. 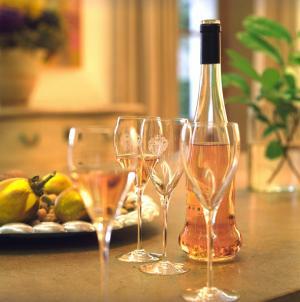 This type of glass is specifically designed for sparkling wines to show off the bubbles. Plus, the tall graceful design of the glass is meant to help sparkling wines retain their sparkle or bubbles. Another important reason to use a flute as opposed to a saucer is that the long stem of a flute prevents body heat from transferring to the wine. When most people hold Champagne saucers, they hold it by the bowl of the glass and not the stem. Holding the bowl will warm the Fragolino, ruin its delicate bouquet and result in a bland tasting sparkling wine. The effect of body heat transference will also cause the Fragolino to lose its delicate bubbles relatively quickly. The light, fruity flavor characteristics and delicate strawberry scented aromas make this bubbly perfect for a number of different occasions. Whether you are enjoying a day at the beach or on a boat, a breezy summer picnic, or a cold winter night cuddled up by the fire, this wine is perfect. Fragolino is not nearly as expensive as Champagne, making it an affordable option for anyone to consider.